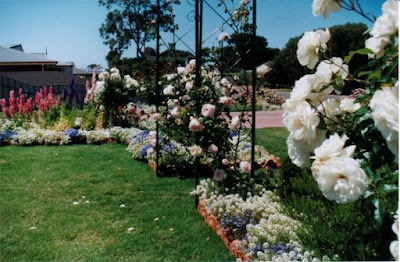 The love of a garden was instilled into me when I was a very young child. There were certain flowers in our big yard that I was allowed to pick to make 'fairy rings'. Others, like the roses, I was allowed to take in their perfume. Then there was the honeysuckle making its amazing orange display. I used to drink the sweet syrup out of the flowers, against my mother's advice and her fear that I would be poisoned! Once I was married, one of the first things I did in each home we had, was to make or fix up a garden. Out of the seven homes we have lived in, two of them were brand new homes we built, so I had the joy of establishing those gardens from scratch. 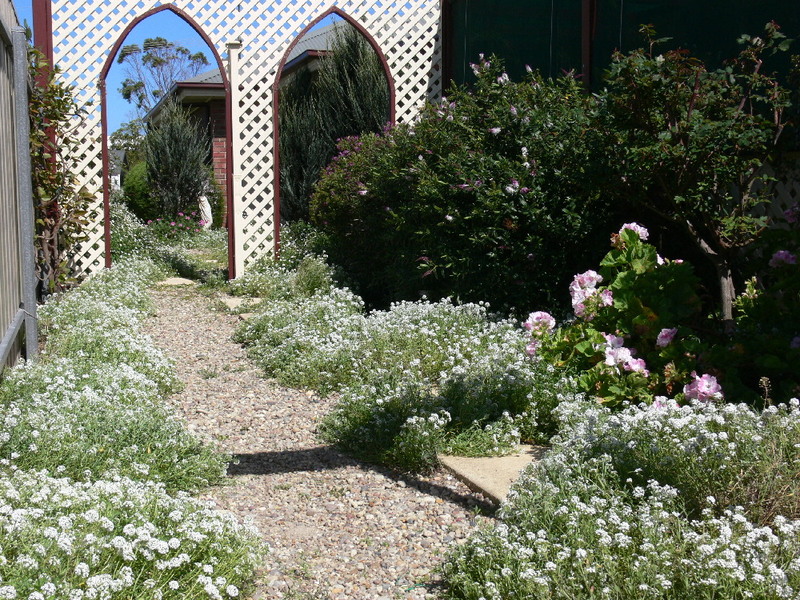 It was so amazing to be able to organise a whole yard of gardens, flowing from one area to another. It was the adult version of my magical childhood fairy rings, with little alcoves of beauty, garden 'rooms' to wander through and something lovely to look at from every room in the house. I just loved the quick results from planting seeds or seedlings to flowers, fruit or vegetables in a matter of months. There aren't too many things in life that give such quick success. Raising children is just about a life-long job. Relationship building takes a long time. Becoming proficient in a job doesn't happen overnight. 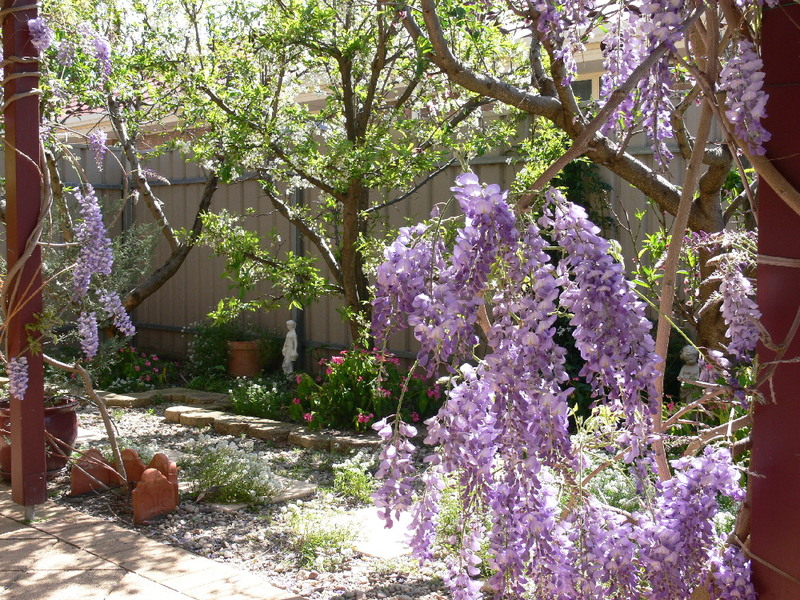 But gardening is so rewarding and the benefits and joy seem to far outweigh the amount of time, effort and money spent. I even won a couple of prizes in the local Progress Association Garden Contests. But now I am older and we live in the subtropics and I have lost the ability to stay out in the burning sun for hours tending gardens. On top of that we have to pay for every drop of water we use so it isn't really possible to have a garden like I used to when water was not the luxury it now is. Life is different today. I have my vegie gardens and our courtyard is full of luxuriant ferns and some pretty pot plants, so I am happy. But when there is a hankering after times past and a lingering regret that I no longer have my beautiful gardens, I grab the needle and thread and produce one in stitches! This week I revisited an old pattern and refreshed it, updated it, enlarged it and made it into this sweet pincushion. I hope this design stimulates you to imagine all the beauty that is beyond this garden gate. If you would like to make your own "Garden Gate Pincushion", the pattern can be purchased on my Pincushion Page. Val, I too avoid being outside in the garden in the summer months. In winter it is a different story. Also it is just too hot for the plants so I don't have many veggies growing this year. Not enough rain either. As usualy your stitching is beautiful. I loved seeing all the flowers and gardens you posted. 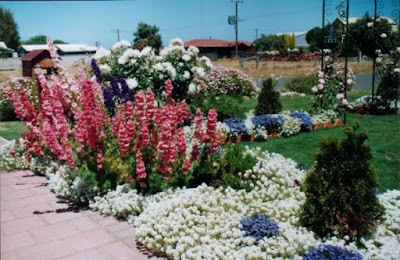 I also love growing flower gardens and having vegetable gardens I have had them for 39 years. I have been struggling to keep up because of my age and health problems. I have been trying to come up with up ideas for an easier way to grow flowers and vegetables. I have several of your patterns. They are so beautiful! Thank you for sharing your pictures. I do wish I had the time to work in the garden. Working full time and having other hobbies makes it hard. And like you, I so enjoy stitching garden things. Oh Val, I wanted to tell you that I'm working on your blocks again (after several years in the closet). The timing is just right and I'm enjoying them so much! Thank you designing them and giving us the BOM patterns. I have purple fingers when it comes to gardening, so our garden is mostly native plants self seeded by visiting birds! A small experimental vegie patch has been moderately successful, but I've no desire to enlarge it. I love that pincushion Val! I've got a collection of pincushions that I put out on display in a large bowl sometimes. They are just tumbled in there, but it looks so pretty. Thank you for sharing the beautiful flower photographs. So nice when we have had such dismal weather!